Two new developments in our war on speeding – new speed indicator signs in Farm Road. These do have an impact on traffic speeds, as people are reminded how fast they are going. Where else should we have them? 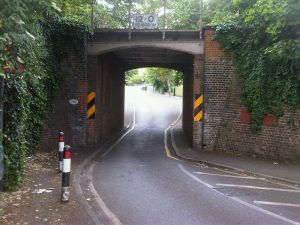 And the width restriction has now been installed in Grange Vale to slow traffic passing under the bridge, which will be of benefit to pedestrians passing along the narrow pavement under the bridge against the flow of traffic (in particular if pushing a buggy). 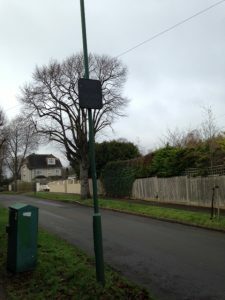 Almost as soon as the width restriction was installed on 22 January it was vandalised, with one of the bollards being removed. This must have been done by someone with sophisticated cutting equipment. the road will be closed again on Monday 5 February for the bollard to be replaced.